Here’s one thing I love about shopping on Amazon. It can make your life easier in unexpected ways. These are all opportunities to profit in a big, big way! For example, you can go online and order the MagnoGrip Wrist Band. This invention has a very simple purpose. It helps you keep nails, screws, and bolts from rolling away as you work. You simply strap it around your wrist to keep metal items literally at hand. It’s clear that DIY enthusiasts love this item. Hunting for lost nails can sour any project you’re working on. The MagnoGrip Wrist Band keeps things stress-free. But this product is also a huge hit among professional repairmen. It has helped carpenters, mechanics, and other tradespeople. MagnoGrip was started by a college student. It took a lot of determination and clever marketing to get this business off the ground. If you’re planning to become an Amazon seller, you need the same entrepreneurial spirit. This company recognized a problem we all had to deal with sometimes. The solution to the problem was simple, but it was something nobody had ever thought of before. That’s exactly what you have to do to build your own niche. I know it can be tough to figure out where to start. But you can take inspiration from your old job, your hobbies, or your everyday routine. Recognizing a need is the first step. Then, it’s up to you to find the products that’ll help resolve it. Asking for some guidance can be a good idea. Why not make use of the experiences of sellers who’ve been in your shoes? Join us on a FREE webinar now to get the answers you’re looking for. All of my experience is at your disposal. 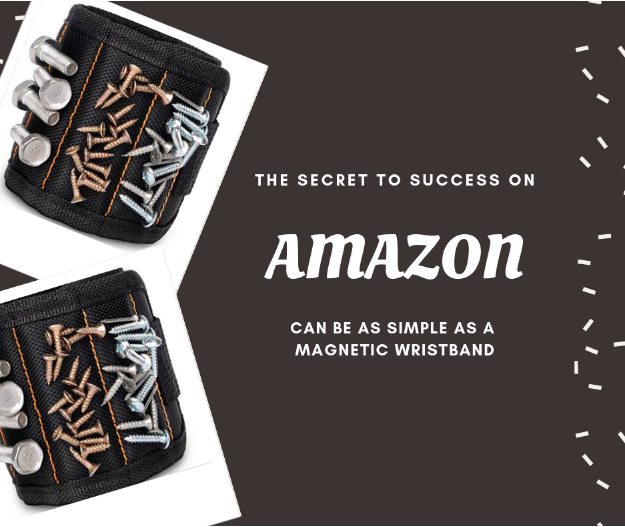 The secret to success on Amazon can be as simple as a magnetic wristband.